Endolymphatic sac (ES) shunt surgery is a treatment for medically refractory disabling vertigo in Meniere disease, which is an inner ear disorder that features the symptomatic tetrad of episodic vertigo, aural fullness, fluctuating sensorineural hearing loss, and tinnitus. Endolymph is produced by the stria vascularis and flows toward the endolymphatic sac, where it is resorbed. The endolymphatic sac has been the center of attention for the treatment of Meniere disease. If Meniere disease is related to an excessive accumulation of endolymph, the basis for endolymphatic sac surgery would be to surgically release the endolymphatic sac from its bony and dural confines to relieve the pressure via decompression or to incise the sac to drain the endolymph via shunting. Surgery on the endolymphatic sac for the control of vertigo dates back to 1927, when it was performed by Georges Portmann. He believed that Meniere syndrome resulted from overpressure of the endolymphatic fluid due to either an endolabyrinthine or extralabyrinthine cause. He used the term “aural glaucoma” to describe the situation in the inner ear. In his procedural descriptions, he simply incised the endolymphatic sac and allowed the clear endolymphatic fluid to drain. In this manner, he successfully treated numerous patients with vertigo. The endolymphatic sac’s role in Meniere disease was more convincing after surgical obliteration or occlusion of the endolymphatic duct and sac led to a histologic endolymphatic hydrops in animal studies. [5, 6] Surgeries either to surgically open the endolymphatic sac and stent the lumen of the sac open with a shunt or to simply decompress the sac were performed with successful control of vertigo in Meniere disease. The precise mechanism by which endolymphatic sac surgery helps to control the vertigo is unknown. However, endolymphatic sac surgery stands as the only surgical nonablative option for the treatment of Meniere disease. Thus, hearing can be preserved with such an operation, in contradistinction to the ablative surgical options. Endolymphatic sac shunting is indicated for the control of the disabling vertigo of Meniere disease that has failed to improve with medical therapy. The side of involvement in unilateral Meniere disease should be clearly evident based on audiography and auditory symptoms, such as tinnitus and aural fullness. The patient should meet the most current criteria for the diagnosis of Meniere “definite” disease. If bilateral Meniere disease is present, endolymphatic sac surgery is performed on the worse offending symptomatic side. Medical management of Meniere disease includes a low-salt diet and diuretics. Other adjunctive medical options include vasodilators, systemic or intratympanic corticosteroids, and allergy or immune-mediated treatment. Vestibular suppressants and sedatives are used for symptomatic control of vertigo. If these are not sufficient to control the episodic, disabling vertigo, either nonablative or ablative therapies may be considered. Ablative treatment involves destruction of the neuroepithelium or sensory structures of the inner ear (deafferentation). Therefore, permanent hearing loss and vestibular dysfunction can be expected after such therapy. Ablative procedures include intratympanic gentamicin (chemical labyrinthectomy), surgical labyrinthectomy, and vestibular nerve section. The only nonablative treatment is endolymphatic sac surgery. Patients who do not fulfill the diagnostic criteria of “definite” Meniere disease should not be considered for endolymphatic sac shunt surgery. Patients with vertigo due to nonvestibular causes or central nervous system abnormalities should not undergo endolymphatic sac surgery. Patients with definite Meniere disease whose condition is well-controlled with medical therapy should not undergo endolymphatic sac shunt surgery. These include patients with infrequent vertiginous attacks who can still carry on daily life activities, relatively uninterrupted by the dizziness. Patients who are chronically imbalanced and affected with disequilibrium should not undergo endolymphatic sac surgery, as these symptoms result from to end-organ vestibular damage due to long-term Meniere disease. 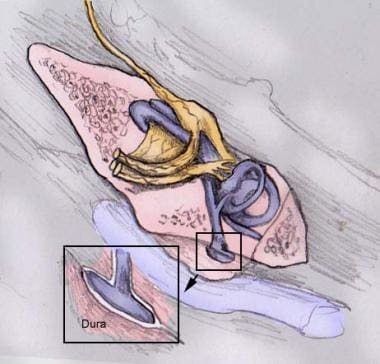 Endolymphatic sac surgery is not used to reverse longstanding hearing loss, to eliminate aural fullness, or to alleviate the tinnitus of Meniere disease. Surgical access to the endolymphatic sac is via a postauricular transmastoid extradural approach. Standard mastoidectomy procedures are followed with the additional steps of skeletonization of the sigmoid sinus extending inferiorly toward the jugular bulb, sinodural angle, and the posterior fossa dura that lies between the sigmoid sinus and posterior semicircular canal. The endolymphatic sac is extradurally located on the posterior fossa dura in the infralabyrinthine region as a dural duplication or thickening. The decision by the surgeon to proceed with either endolymphatic sac decompression or endolymphatic sac shunt placement to the mastoid depends on surgeon preference, experience, and clinical outcomes. Potential structures at risk for injury include posterior semicircular canal leading to fenestration and labyrinthine injury, posterior fossa dura leading to cerebrospinal fluid (CSF) leak, facial nerve leading to paralysis, and sigmoid sinus leading to hemorrhage. Hallpike CS, Cairns H. Observations on the Pathology of Ménière's Syndrome: (Section of Otology). Proc R Soc Med. 1938 Sep. 31(11):1317-36. [Medline]. [Full Text]. Yamakawa K. Uber die pathologische Veranderung beieinem Meniere-Kranken. Proceedings of 42nd Annual Meeting Oto-Rhino-Laryngol Soc Japan. 1938;4:2310-2312. Me´nie`re P. Sur une forme de sourdite´ grave de´pendant d’une le´sion de l’oreille interne. Gaz Med Paris. 1861;16:29. Portmann G. The saccus endolymphaticus and an operation for draining the same for the relief of vertigo. J Laryngol Otol. 1927;42:809-819. Kimura RS, Schuknecht HF. Membranous hydrops in the inner ear of the guinea pig after obliteration of the endolymphatic sac. Pract Otorhinolaryngol. 1965;76:343-354. Kimura RS. Experimental blockage of the endolymphatic duct and sac and its effect on the inner ear of the guinea pig. A study on endolymphatic hydrops. Ann Otol Rhinol Laryngol. 1967 Aug. 76(3):664-87. [Medline]. Quaranta A, Marini F, Sallustio V. Long-term outcome of Ménière's disease: endolymphatic mastoid shunt versus natural history. Audiol Neurootol. 1998 Jan-Feb. 3(1):54-60. [Medline]. Glasscock ME 3rd, Gulya AJ, Pensak ML, Black JN Jr. Medical and surgical management of Meniere's disease. Am J Otol. 1984 Oct. 5(6):536-42. [Medline]. Brackmann DE, Nissen RL. Menière's disease: results of treatment with the endolymphatic subarachnoid shunt compared with the endolymphatic mastoid shunt. Am J Otol. 1987 Jul. 8(4):275-82. [Medline]. Maddox HE 3rd. Surgery of the endolymphatic sac. Laryngoscope. 1981 Jul. 91(7):1058-62. [Medline]. Sood AJ, Lambert PR, Nguyen SA, Meyer TA. Endolymphatic sac surgery for Ménière's disease: a systematic review and meta-analysis. Otol Neurotol. 2014 Jul. 35(6):1033-45. [Medline]. Shambaugh GE Jr. Surgery of the endolymphatic sac. Arch Otolaryngol. 1966 Apr. 83(4):305-15. [Medline]. Shambaugh GE Jr. Effect of endolymphatic sac decompression on fluctuant hearing loss. Otolaryngol Clin North Am. 1975 Jun. 8(2):537-40. [Medline]. Graham MD, Kemink JL. Surgical management of Meniere’s disease with endolymphathic sac decompression by wide bony decompression of the posterior fossa dura: technique and results. Laryngoscope. 1984;95:680-683. Albu S, Babighian G, Amadori M, Trabalzini F. Endolymphatic sac surgery versus tenotomy of the stapedius and tensor tympani muscles in the management of patients with unilateral definite Meniere's disease. Eur Arch Otorhinolaryngol. 2014 Dec 7. [Medline]. Committee on Hearing and Equilibrium guidelines for the diagnosis and evaluation of therapy in Menière's disease. American Academy of Otolaryngology-Head and Neck Foundation, Inc. Otolaryngol Head Neck Surg. 1995 Sep. 113(3):181-5. [Medline]. Kitahara T, Kubo T, Okumura S, Kitahara M. Effects of endolymphatic sac drainage with steroids for intractable Meniere's disease: a long-term follow-up and randomized controlled study. Laryngoscope. 2008 May. 118 (5):854-61. [Medline]. Wick CC, Manzoor NF, McKenna C, Semaan MT, Megerian CA. Long-term outcomes of endolymphatic sac shunting with local steroids for Meniere's disease. Am J Otolaryngol. 2017 May - Jun. 38 (3):285-290. [Medline]. Donaldson line used to approximate location of endolymphatic sac. The right endolymphatic sac is opened. Shunt may be placed inside the lumen of the sac.